You can make a list of second-string heroes in the DC Universe, and the Metal Men would be firmly on there. Something big would need to happen to move them up the pecking order, but we are not holding our breath. I would not advise a fresh investment in this book at the moment, but if you own one, hold it for now rather than selling. Seems rare in high grade. We've seen this book numerous times this year -- more than any other -- but it's never really nice. 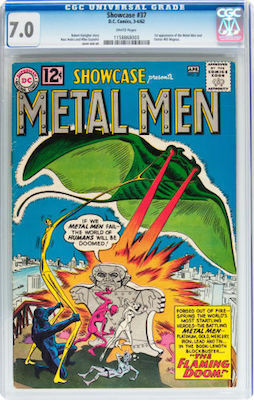 Typical of DC Silver Age comic books, in that they are usually lower grade than equivalent Marvels from the same era. A nice high-grade CGC 8.5 is the highlight of recent transactions. 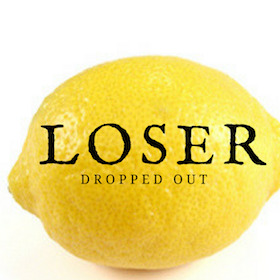 Lower grades have seen slight correction, but the sentiment remains optimistic on this book. Speculation in comic books is a strange thing. A few years ago, now-key issues like Brave and the Bold #25 (first Suicide Squad) were unsaleable boat anchors. As soon as DC announced the Suicide Squad movie, prices went ballistic. The knock-on effect of all the movie hype is to try to second-guess what else DC might create movies out of, or which characters might cross over. 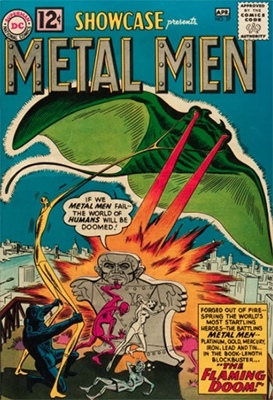 Metal Men is definitely not an A-list team, probably third-string in fact, but that hasn't stopped the rumor mill from creating "crazy" demand for this book, a tough first appearance from the Silver Age. It's a difficult run to put together, being early Silver Age and highly desirable. Happy hunting.